Adult content producer Ventura Content has petitioned the court to clarify how and when the DMCA protects online services from piracy liability. According to Ventura, the lower courts have "given birth to a new monster," the online service provider that is "brazenly rich only from others’ content." The DMCA’s “repeat infringer” issue is a hot topic in US courts, leading to much uncertainty among various Internet services. Under the DMCA, companies are required to implement a reasonable policy to deal with frequent offenders. This applies to residential ISPs but also to websites that host user-uploaded content, such as video and image hosting platforms. 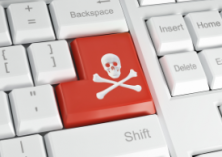 Services that fail to implement a repeat infringer policy risk being held liable for the piracy activities of their users. This is what happened to Cox previously. While the ISP settled its case last week, the issue is not off the agenda. In fact, a related matter is currently before the US Supreme Court. The petition was submitted by adult content producer Ventura Content. The company previously lost its case against the video upload site Motherless.com, through which hundreds of thousands of copyright infringing videos were made public. Ventura argued that the sole operator of the site was liable, as he failed to write down the details of the site’s repeat infringer termination policy. However, the Court of Appeals for the Ninth Circuit disagreed. The fact that the details of the policy were not spelled out doesn’t mean that Motherless has no safe harbor protection, the Court concluded, noting that this may be different for large companies. In addition, Motherless was not required to keep a log of all infringements, as long as the operator keeps track of these in his head. The adult company was obviously not happy with this outcome. It requested an ‘en banc’ rehearing review of the published opinion, but that was denied as well. The next logical step, therefore, was to take the matter to the Supreme Court. 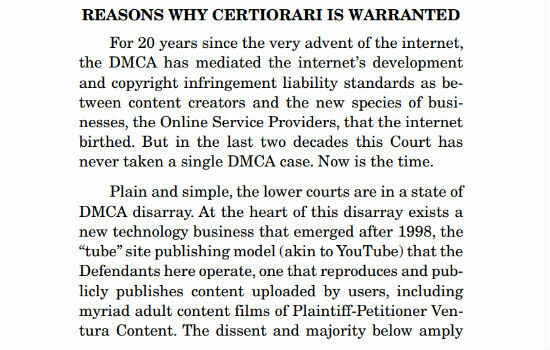 “Plain and simple, the lower courts are in a state of DMCA disarray,” Ventura writes in its recent Supreme Court petition. The adult company is asking the Supreme Court to take on the case, noting that various circuit courts have issued conflicting decisions. For example, in the present case an “I Know It When I See It” policy was good enough for a summary judgment in its favor, while MP3tunes was previously denied the same because it failed to monitor users. Ventura asks the Supreme Court to clearly define a standard which can be uniformly applied by lower courts. At the moment it appears that there is too much room for interpretation, which causes confusion and seemingly conflicting decisions. This vagueness has been recognized in previous “repeat infringer” cases. To illustrate this, even judges themselves are not clear what a repeat infringer actually is, as the DMCA doesn’t clearly define it. “How does somebody know a third party is an infringer? ‘Cause you say so?” Judge Shedd previously said in a BMG vs. Cox hearing. The adult producer obviously hopes that if the Supreme Court takes on the case, which is far from certain, it will work out in its favor. If not, they fear that things will only get worse. “The lower courts, acting out of a fear of derailing the internet’s development have instead given birth to a new monster: the OSP publisher that is brazenly rich only from others’ content, never pays for any content it publishes, knows the content is infringing, has full control over what is published on its platform, does not have to terminate known repeat infringers because unwritten ‘I Know Repeat Infringement When I See It’ policies suffice, and thus enjoys full immunity from copyright law,” Ventura writes. “It is time for this Court to bring balance to the DMCA, which never intended, nor facially permits, such staggering dissonance between online and offline liability standards,” the company concludes. A copy of Ventura Content’s petition to the US Supreme Court is available here (pdf).